Morales was quick to note that his election did not mean the poor majority had “won power”. 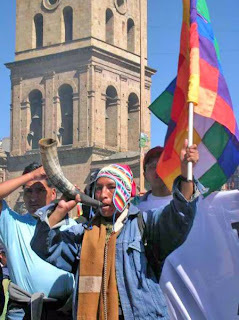 Once elected, Morales, together with the social movements (particular the indigenous and campesino organisations that make up the heart of the MAS), sought to implement the key demands that emerged from the peoples’ struggles: winning back control over Bolivia’s natural resources, in particular the nationalisation of gas; and a constituent assembly to draft a new constitution to “decolonise” the state and end the political exclusion of the indigenous majority. This battle reached a climax in September 2008, after Morales’s crushing victory in a recall referendum on the presidency the previous month. Unleashing a campaign of terror, opposition leaders, the US embassy and some high ranking military officials attempted to carry out a coup. The defeat of the coup created the political space for the adoption of the new constitution and Morales’s re-election. The MAS now enjoys a two-thirds majority in the senate. On election night, Morales said the MAS’s parliamentary majority “obliges me to accelerate the process of change”. Only days after his re-election, Morales ordered the seizure of 12,500 hectares of land illegally acquired by the family of Branco Marinkovic, one of the country’s largest soybean magnates and a leader of the violent campaign to overthrow Morales. In a visit to Pando last November, Morales raised these problems. “There are some leaders of my party who think they are the owners of the process”, he said, referring to sectors within MAS that protested the fact that some MAS-backed candidates for the election where not MAS members. Vice-president Alvaro Garcia Linera said in his January 21 swearing in speech that it was necessary to build a new state, “which the Bolivian people have proposed be built from below”. The new state’s three pillars would be: “plurinationality” (recognition of indigenous equality); regional and indigenous autonomy within the framework of “a democratic decentralisation of power”; and a mixed economy in which the state plays the central role in strategic sectors. Garcia Linera also noted the need to spread the socialist revolution internationally. “No revolution can triumph if it is not support by other revolutions in the world. The empire is a global demon, and the only way to defeat it is with another globalisation, otherwise the empire will impose itself.